The Committee for a Responsible Federal Budget has published a nice review of how Social Security interacts with the rest of the federal budget – a subject that generates confusion even at the highest levels of government. "The Social Security Windfall Elimination and Government Pension Offset Provisions for Public Employees in the Health and Retirement Study"
Social Security Bulletin. 74(3): 55-69. This article examines the Social Security Windfall Elimination Provision and Government Pension Offset. These provisions reduce the Social Security benefits of workers (and the resulting benefits of their spouses) if the prime beneficiary worked in “noncovered” employment (in which Social Security payroll taxes were not paid) that provided a pension, or if the spouse or survivor earned a pension from noncovered work. Using Health and Retirement Study data uniquely suited to the analysis, the authors calculate the household-level average lifetime benefit reductions resulting from these provisions and examine them in the context of lifetime Social Security income, pension income, and total wealth. The analysis also isolates the effects of pensions from noncovered employment on benefit adjustments and wealth. "Health Effects of Containing Moral Hazard: Evidence from Disability Insurance Reform"
We exploit an age discontinuity in a Dutch disability insurance (DI) reform to identify the health impact of stricter eligibility criteria and reduced generosity. Women subject to the more stringent rule experience greater rates of hospitalization and mortality. A €1,000 reduction in annual benefits leads to a rise of 4.2 percentage points in the probability of being hospitalized and a 2.6 percentage point higher probability of death more than 10 years after the reform. There are no effects on the hospitalization of men subject to stricter rules but their mortality rate is reduced by 1.2 percentage points. The negative health effect on females is restricted to women with low pre-disability earnings. We hypothesize that the gender difference in the effect is due to the reform tightening eligibility particularly with respect to mental health conditions, which are mor e prevalent among female DI claimants. A simple back-of-the-envelope calculation shows that every dollar reduction in DI is almost completely offset by additional health care costs. This implies that policy makers considering a DI reform should carefully balance the welfare gains from reduced moral hazard against losses not only from less coverage of income risks but also from deteriorated health. "Is Health Care an Individual Necessity? Evidence from Social Security Notch"
This paper exploits Social Security legislation changes to identify the causal effect of Social Security income on out-of-pocket medical expenditures of the elderly. Using the household level consumption data from the 1986-1994 Consumer Expenditure Survey and an instrumental variables strategy, the empirical results show that the estimated income elasticities of out-of-pocket total medical costs, medical service expenses, and prescription drug expenses are about 0.89, 1.05, and 0.86, respectively. The estimated elasticities increase substantially and are statistically significant for elderly individuals with less than a high school education. The corresponding income elasticities are 2.49, 3.66, and 1.38, respectively. The findings are in sharp contrast to existing studies that use micro-level data and provide evidence that health care is a luxury good among the low education elderly. Unlike workers in many developed nations, far too few American workers today can look forward to financial independence as they age. As a result, many will be compelled to work much later into their lives, some into their 70s. Social Security provides only a floor of retirement income. For many years defined benefit (DB) plans provided the core of retirement security, but today most DB plans in the private sector are closed to new employees, and those in the public sector are dramatically underfunded. A patchwork of defined contribution (DC) retirement plans – such as 401(k) 403 (b), and IRA – now serve as the primary retirement saving vehicles in the private sector, but they are complex, costly, and challenging for employers and employees to manage. This paper recommends a single private DC pension system that can cover all working Americans, with a single set of rules. A key part is the creation of broadly diversified Trusteed Retirement Funds (TRFs), whose sponsors are trustees, with fiduciary responsibilities. Payroll deduction of every employee’s salary will automatically go into a broadly diversified TRF unless the employee either opts out or selects a preferred TRF (and unless the employer already sponsors a defined benefit pension plan). TRF’s will relieve employers from fiduciary responsibility for all future DC contributions. To protect retirees from the risks of inflation, longevity, and the unpredictability of the stock and bond markets, retirees will be encouraged to use their TRF savings to buy either an immediate or deferred indexed annuity. A Federal Longevity Insurance Administration will enable private insurance companies to provide cost-effective annuities. All TRFs and annuities will be without marketing costs. Tax deductions will be designed to stay within our nation’s current tax expenditures for retirement. This paper offers a basis for near-term action by Congress and the Administration to help resolve the growing problem of funding workers’ retirement. The details of the [2014 Social Security Trustees] report clearly show that the crisis in Social Security is not only deepening but widening as well. The reasonable solvency of the system was reduced over the course of 2013 from 19 years to 18 years. This reduction means that for the first time in history on average someone retiring today at normal retirement age expects to outlive full benefits. Anyone who is 48 years old or younger roughly expects to retire after the system pays depleted benefits. This, believe it or not, is the good news. The bad news is that the size of the crisis arriving in 2033 is growing rapidly. The report reveals that the unfunded liabilities now exceed the Gross Domestic Product of the entire county. The financing shortfall grew by $1.8 trillion. The growth means that Social Security created more than $2 of broken promises for every dollar that it collected ($855 Billion in 2013). The grand total of unfunded liabilities exceeds all revenue ever collected by the system since its inception. The 2014 report projects depletion of the combined Old Age, Survivors, and Disability Insurance trust funds in 2033. 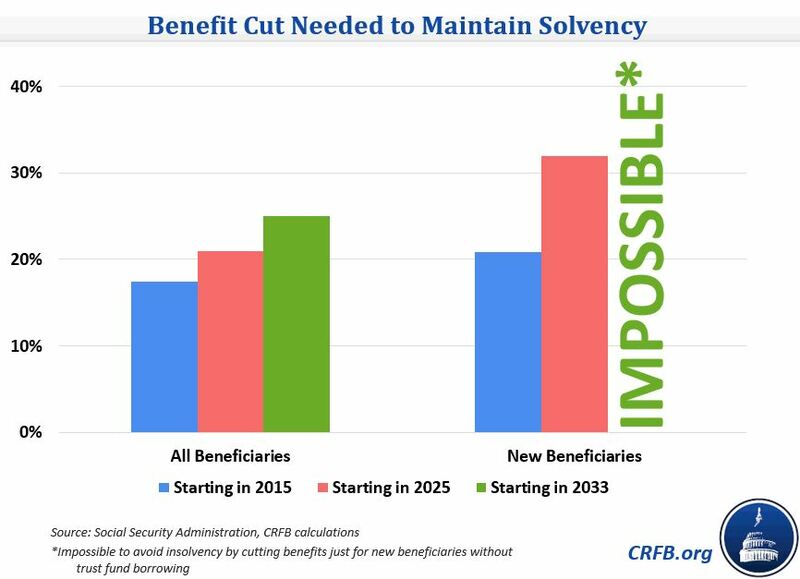 Social Security has no borrowing authority, and after the trust funds are exhausted there is only enough payroll tax revenue to cover a projected 77 percent of benefits; meaning future benefit payments must be reduced by about 23 percent. But the resulting cut in benefits will actually be much worse for retirees, workers and the economy if we don’t act now to reform Social Security. "Employee Benefits: Today, Tomorrow, and Yesterday"
In 2013, the nonpartisan Employee Benefit Research Institute (EBRI) commemorated its 35th anniversary. While much has changed with health and retirement benefits during the past three decades -- the first generation of the Employee Retirement Income Security Act (ERISA) -- many of the issues that were present at EBRI’s beginning remain today. But even if core issues endure, the historic shift away from “traditional” defined benefit pension plans and toward 401(k)-type defined contribution retirement plans, along with the recent enactment of the Patient Protection and Affordable Care Act of 2010 (PPACA), and the demographic shifts attendant with the retirement of the Baby Boomers and the workplace ascendency of the Generation X and Millennial cohorts, employee benefits are certain to continue to change and evolve in the future. Each year EBRI holds two policy forums which bring together a cross-section of national experts in the benefits field, congressional and executive branch staff, and representatives from academia, interest groups, and labor to examine public policy issues affecting health and retirement benefits. This paper summarizes the presentations and discussions at EBRI’s 73rd policy forum held in Washington, DC, on Dec. 12, 2013. Titled “Employee Benefits: Today, Tomorrow, and Yesterday,” the symposium offered expert perspectives on not only the workplace and work force of the past, but the challenges of today’s multi-generational workplace, and the difficulties and opportunities that lie ahead. Following a review of the benefits landscape by EBRI’s research team, panels discussed: 1978 to 2013: The Changing Role of Employers in Employee Benefits; Employee Benefits from 2013 to 2048: The Road to Tomorrow; 2013 to 2048: Work Force Trends and Preferences, Today and Tomorrow. "Lifetime Accumulations and Tax Savings from HSA Contributions"
2014 marks the 10-year anniversary of the introduction of health savings accounts (HSAs), created by Congress in 2003. In 2013, enrollment in HSA-eligible health plans was estimated to range from 15.5 million to 20.4 million policyholders and their dependents. Nearly 11 million accounts holding $19.3 billion in assets as of Dec. 31, 2013, were also estimated. The number of HSA-eligible enrollees will differ from the number of accounts for various reasons. The number of enrollees is composed of the policyholder and any covered dependents and will generally be higher than the number of accounts because one account is usually associated with a family. However, over time, the number of accounts can grow relative to the number of enrollees because when an individual or family is no longer covered by an HSA-eligible plan, they are allowed to keep the HSA open. HSAs provide account owners a triple tax preference. Contributions to an HSA reduce taxable income. Earnings on the assets in the HSA build up tax free, and distributions from the HSA for qualified expenses are not subject to taxation. Because of this triple tax preference, some individuals might find using an HSA as a savings vehicle for health care expenses in retirement more advantageous from a tax perspective than saving in a 401(k) plan or other retirement savings plan. This paper examines the amount of money an individual could accumulate in an HSA over his or her lifetime. It also examines lifetime tax savings from HSA contributions. Limitations of an HSA are also discussed. A person contributing for 40 years to an HSA could save up to $360,000 if the rate of return was 2.5 percent, $600,000 if the rate of return was 5 percent, and nearly $1.1 million if the rate of return was 7.5 percent, and if there were no withdrawals. In order to maximize the savings in an HSA to cover health care expenses in retirement, HSA owners will need to pay the medical expenses they incur prior to retirement on an after-tax basis using money not contributed to their HSA. Many individuals may not have the means to both save in an HSA and pay their out-of-pocket health care expenses. Also, HSA balances may not be sufficient to pay all medical expenses in retirement even if maximum contributions are made for 40 years. "What Does Consistent Participation in 401(k) Plans Generate? Changes in 401(k) Account Balances, 2007-2012"
This paper analyzes changes in 401(k) account balances of consistent participants in the EBRI/ICI 401(k) database over the five-year period from year-end 2007 to year-end 2012. About 34 percent, or 7.5 million, of the 401(k) participants with accounts at the end of 2007 in the EBRI/ICI 401(k) database are in the consistent sample. Analysis of a consistent group of 401(k) participants highlights the impact of ongoing participation in 401(k) plans. The analysis also looks at changes in asset allocation between year-end 2007 and year-end 2012. Overall, the average account balance of consistent 401(k) participants increased at a compound annual average growth rate of 6.8 percent from 2007 to 2012, to $107,053 at year-end 2012. The median 401(k) account balance increased at a compound annual average growth rate of 11.9 percent over the period, to $49,814 at year-end 2012. At year-end 2012, the average account balance among consistent participants was 67 percent higher than the average account balance among all participants in the EBRI/ICI 401(k) database. The consistent group’s median balance was almost three times the median balance across all participants at year-end 2012. Younger participants or those with smaller initial balances experienced higher percent growth in account balances compared with older participants or those with larger initial balances. Three primary factors impact account balances: contributions, investment returns, and withdrawal/loan activity. The percent change in average account balance of participants in their 20s was heavily influenced by the relative size of their contributions to their account balances and increased at a compound average growth rate of 41.8 percent per year between year-end 2007 and year-end 2012. 401(k) participants tend to concentrate their accounts in equity securities. The asset allocation of the 7.5 million 401(k) plan participants in the consistent group was broadly similar to the asset allocation of the 24.0 million participants in the entire year-end 2012 EBRI/ICI 401(k) database. On average, about three-fifths of 401(k) participants’ assets were invested in equities, either through equity funds, the equity portion of target-date funds, the equity portion of non-target-date balanced funds, or company stock. Younger 401(k) participants tend to have higher concentrations in equities than older 401(k) participants. More consistent 401(k) plan participants held target-date funds at year-end 2012 than at year-end 2007, on net; a third of those with target-date funds held all of their 401(k) account in target-date funds. "Social Security Finances: Findings of the 2014 Trustees Report"
The 2014 Trustees Report updates projections about the future finances of Social Security’s two trust funds. The Disability Insurance (DI) trust fund, which is legally separate from the Old-Age and Survivors Insurance (OASI) trust fund, will require legislative action soon to ensure that all scheduled benefits for disabled workers and their families can be paid in 2016 and beyond. Of the 6.2 percent of earnings that workers and employers each pay into Social Security, 5.3 percent goes to the OASI trust fund and 0.9 percent goes to the DI trust fund. A 0.2 percentage-point increase in the DI contribution rate (from 0.9 percent to 1.1 percent for workers and employers each) would fully fund the DI program for the next 75 years. Alternatively, a temporary reallocation of part of the OASI contribution rate would strengthen DI while keeping the OASI fund adequately funded for many years into the future. On a combined OASDI basis, Social Security is fully funded until 2033, but faces a long-term shortfall thereafter. In 2013, Social Security revenue plus interest income exceeded outgo by $32 billion, leaving a surplus. Reserves, now at $2.8 trillion, are projected to grow to $2.9 trillion by the end of 2019. Then, if Congress takes no action in the meantime, reserves would start to be drawn down to pay benefits. If Congress does not act before 2033, Social Security is projected to face a shortfall. Its reserves would be depleted and revenue continuing to come into the trust funds from workers’ and employers’ contributions and taxation of benefits would cover about 77 percent of scheduled benefits (and administrative costs, which are less than 1 percent of outgo). Timely revenue increases and/or gradual benefit reductions can bring the program into balance over the long term, preventing the projected shortfall. "Why Some Workers Should Be Allowed a 'Buy-In' for Social Security: A Policy Suggestion to Reduce the Regressive Adjustments of the Windfall Elimination Provision"
The Windfall Elimination Provision adjusts, through a reduction, the retirement income for workers who qualify for Social Security retirement benefits and have retirement benefits from employment outside of that system. While the WEP adjustment for workers with pensions from non-covered employment (which is common from employment by state and local governments that do not participate in the Social Security) has received some attention, there is little information for workers who have the same mix of earnings but who do not and will not receive a pension. This situation arises when workers receive their non-covered retirement benefits in a lump sum or in an Optional Retirement Plan. This paper details the WEP adjustment for these workers and suggests a policy that reduces the probability that total retirement income from the combined earnings will be less than Social Security retirement benefits as if all earnings were covered by Social Security. "Financial Literacy Among American Indians and Alaska Natives"
"Incorrect World Bank Pension Data – Consequences for Policy Making in Eastern Europe and Possible Remedies"
The Committee for a Responsible Federal Budget has an update to their memo on the costs of delaying a fix for Social Security. But it’s not just fancy charts: check out the whole story here. The short story – as I see it, at least: Social Security has a big shortfall which needs to be filled either by raising taxes or cutting benefits. Any solution will be painful, but it’s less painful if we spread a little around to everybody. For each year we delay, we’re exempting another cohort of participants from the pain of reform, which means more for everyone else. That’s not good policy and it’s also not very fair. Maya MacGuineas of the Committee for a Responsible Federal Budget debunks some Social Security myths in an op-ed piece for the McClatchy syndicate. Over at Forbes, University of Illinois economist Jeffrey Brown hits on one of my personal pet peeves: the misunderstanding of how Social Security’s “earnings test” workers. Retirees treat it as a “tax” on work, in part because SSA always told them it was. As a result, retirees work less. In reality, as Jeff shows, the earnings test isn't a tax. Check out his whole piece for details. And for more info, see my 2008 AEI paper: The Tax That Wasn’t. Read more! Ben Ritz of the Concord Coalition delivers a nice wrap-up of the 2014 Social Security Trustees Report as well as making the case for reform. You can check out his piece here. The National Center for Policy Analysis has released “How Social Security Reform Could Benefit Workers,” by Liqun Liu, Andrew J. Rettenmaier and Thomas R. Saving. When workers consider the retirement benefits they expect from Social Security they must also consider the taxes paid during their working years. Average-wage workers retiring today have paid more Social Security taxes than they will receive in retirement benefits, so their net benefits are negative. For future workers, who will have to pay higher taxes to finance the program’s growing expenditures, net benefits will dip even lower. You can read the whole document here. In the New York Times, Boston University economist Larry Kotlikoff writes that policymakers should pay more attention to the “fiscal gap,” which goes beyond measuring government debt to include unfunded obligations for Social Security and Medicare. Video from CRFB Event: "Decoding the Social Security Trustees Report." On July 29, 2014, the Committee for a Responsible Federal Budget held a forum examining the latest numbers on Social Security's finances. Experts weighed in on what the report says about Social Security's solvency and what should be done to ensure it will be there for future generations. Reps. Tom Cole (R-OK) and John Delaney (D-MD) talked about their legislation to establish a Social Security reform commission. Social Security Chief Actuary Stephen Goss gave a presentation on the report and what it means for Social Security's future. The event also included a panel with experts from a wide variety of perspectives, including the American Enterprise Institute's Andrew Biggs, the Mercatus Center's Jason Fichtner, Third Way's Jim Kessler, and the Center on Budget and Policy Priorities's Paul Van de Water. The panel was moderated by Damien Paletta of The Wall Street Journal. Senator Orrin Hatch asked CBO several questions about the implications of altering the Social Security payroll tax rates as well as the taxable maximum (the maximum amount of earnings on which those payroll taxes are imposed). This document provides CBO’s answers to those questions. For the various options discussed, CBO presents the changes that would result in the annual payroll taxes paid by employees and employers, and for people born at various times and with various levels of earnings, the change in their median lifetime payroll taxes and median initial replacement rates (benefits as a percentage of career-average earnings). CBO based its answers on projections issued last September in The 2013 Long-Term Budget Outlook. In that report, the 75-year projection period for Social Security spans 2013 to 2087. All changes to payroll tax rates and the taxable maximum analyzed for this report would begin in January 2015. The hearing will focus on the financial status of Social Security programs, the factors influencing the benefits paid, the status of Americans’ retirement readiness and how workers can be helped to better plan for their retirement. Today e21 published my guide to the latest Social Security trustees’ report (the full report can be found here, a summary here, and a video of our press conference here). The following day I testified on the report (my testimony here and video here). The Social Security report is one of two such annual reports, the other covering Medicare, which I will summarize in my next piece for e21. Social Security’s Disability Insurance Fund Faces Depletion in 2016: The DI fund is projected to be depleted in two years, in the fourth quarter of 2016. Unless the law is changed disability payments will drop suddenly by 19 percent. 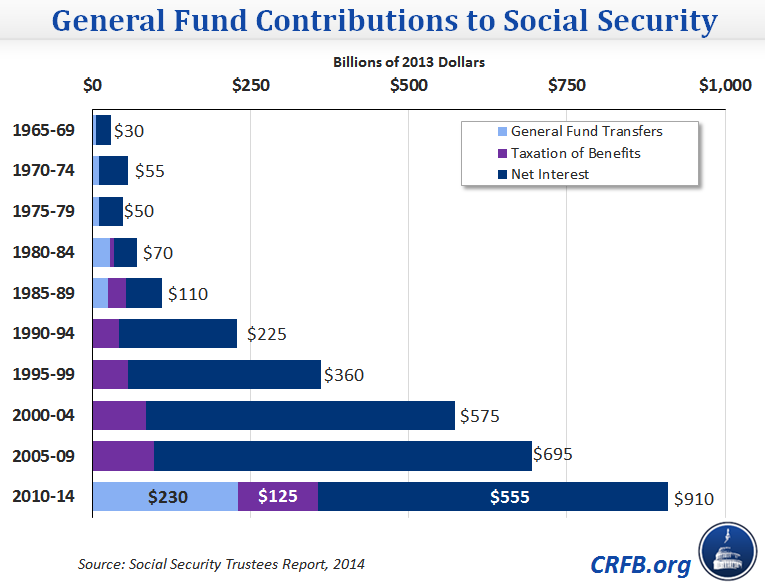 Some have suggested the impending DI fund depletion is appropriately handled by reallocating taxes between Social Security’s trust funds. This suggests a misdiagnosis. OASI actually faces a bigger shortfall than DI. The main reason DI is hitting the wall first is that the baby boomers are moving through their years of peak DI incidence before converting to retirement. 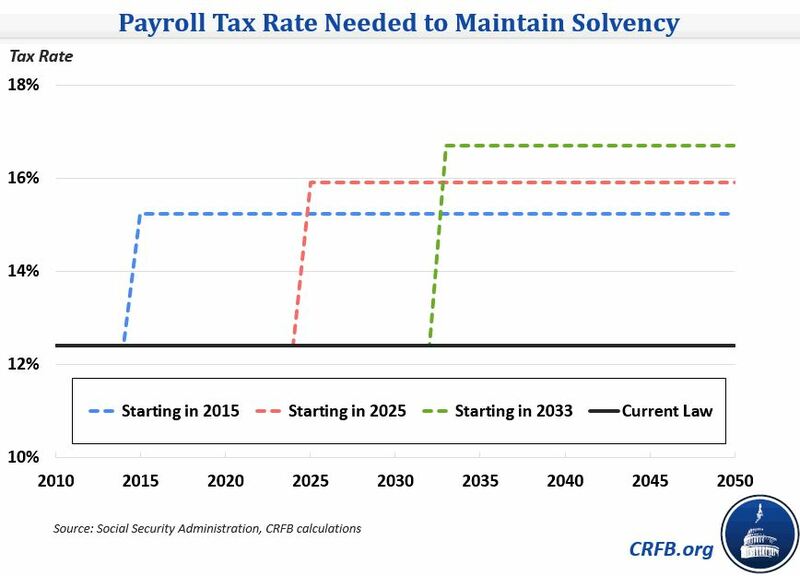 While lawmakers may include interfund borrowing or a temporary tax reallocation as part of a comprehensive solution it would be counterproductive to enact either as a standalone policy, if it served to facilitate continued delay of needed reforms. The Problem Reflects an Excess of Obligations to Those Already in the System: As this table shows the shortfall consists entirely of an excess of scheduled benefits over contributions for people already in the system, not from any inadequacy of contributions by future workers. To the contrary, those now entering the workforce stand to pay far more than they will receive—by 4.4 percent of wages—irrespective of whether the system is balanced by assessing them with higher taxes or lower scheduled benefits. The only way to prevent these income losses for younger generations is to slow benefit growth for those already in the system. We Didn’t Much Change our Long-term Outlook, but the Short-term Problem is More Urgent: We made only minor changes to our long-term assumptions. We Made Some Presentational Improvements: We changed our benefit illustrations to eliminate confusion caused by earlier reports. Many had misinterpreted these as indicating that “benefits replace about 40 percent of preretirement earnings” on average when this was not the comparison made. Lacking a universally agreed-upon method of calculating replacement rates, we simply removed the misunderstood measure. Overall, this year’s report shows us a critical year closer to a Social Security financing crisis, with the certainty of its resolution increasingly in doubt.